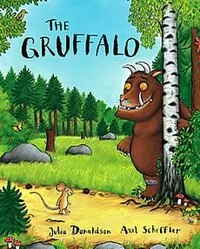 Less a book than a phenomenon, more than 3 million copies of The Gruffalo have been sold in over 30 countries worldwide. Published in 1999, its most prestigious award was the Smarties Book Prize that year. The tiny mouse encounters three hungry predators on his (probably ill-advised) walk through the woods. Each time, he manages to put them off by suggesting that he is meeting up with the Gruffalo, a – so he thinks – fictitious monster “with knobbly knees and turned out toes, and a poisonous wart at the end of his nose.” This creature gets more and more developed with each telling of the tale. As each animal thinks better of eating the mouse he scoffs to himself “doesn’t he know? There’s no such thing as a Gruffalo!” At least, he does until he suddenly runs into one himself. Faced with the terrifying prospect of his own creation (shades of Frankenstein, perhaps!) the quick-witted mouse decides, with incredible bravado, to claim that he is the most terrifying creature in the wood. Of course the other creatures are terrified when the mouse returns with an enormous hairy monster and quickly disappear, leaving the less than quick-witted Gruffalo ‘astounded’. All it takes is the suggestion that the mouse might fancy some Gruffalo crumble and off he runs. 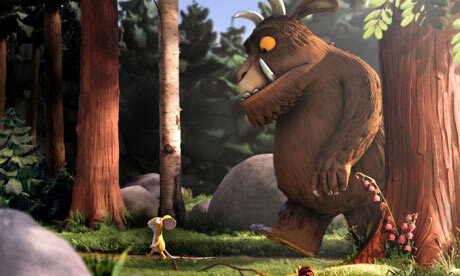 The Gruffalo has been made into a CGI animation in which Axel Scheffler’s world comes attractively to life, and some well-known voices provide those of the central characters. Perfectly crafted and beautifully illustrated, three million readers can’t be wrong: a modern classic.